The CH150 is a charging regulator for an external rechargeable 12 V VRLA (valve-regulated lead-acid) battery, such as the BP12 or BP24 offered by Campbell Scientific. Charging power for the CH150 is typically supplied by an unregulated solar panel, AC/AC transformer, or AC/DC converter. The CH150 provides charging with temperature compensation for optimal charging and battery life. A maximum power point tracking algorithm is incorporated for solar inputs to maximize available solar charging resources. The CH150 is a micro-controller-based smart charger with temperature compensation that optimizes battery charging and increases the battery's life. Two input terminals enable simultaneous connection of two charging sources. They also incorporate a maximum power point tracking algorithm for solar inputs that maximizes available solar charging resources. 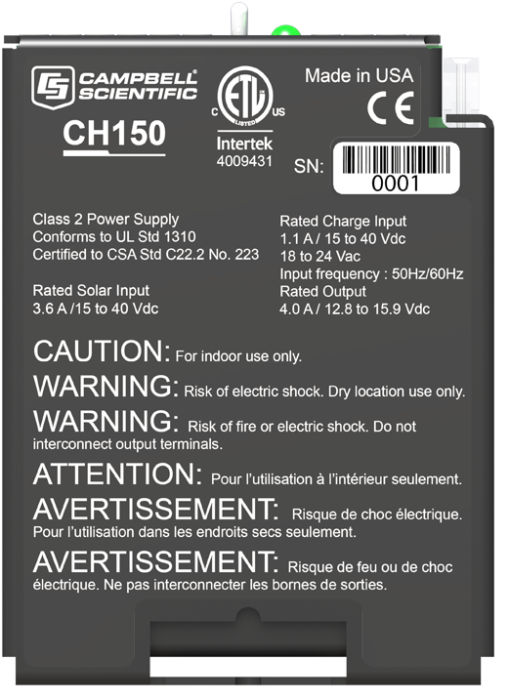 The CH150 has several safety features intended to protect the charging source, battery, charger, and load devices. Battery-reversal protection is included, as well as ESD and surge protection on all of the CH150 inputs and outputs. The CH150 replaced the CH100. -NOTE- Battery voltages below 8.7 V may result in < 3.0 A current limit because of fold-back current limit. -NOTE- The "T" represents temperature in degrees Celsius. CR3000 Typically, a CR3000 datalogger uses its integrated rechargeable base instead of the CH150. However, the CH150 can be used if the data logger has a low-profile base or if the battery base has been disconnected. CR5000 (retired) Typically, a CR5000 datalogger uses its integrated rechargeable base instead of the CH150. However, the CH150 can be used if the data logger has a low-profile base or if the battery base has been disconnected. A desiccated, non-condensing environment is required. The CH150 includes built-in keyhole flanges for mounting to the backplate of a Campbell Scientific enclosure. The CH150 is compatible with the A100 null-modem adapter and the A105 adapter for additional 12 V output terminals. The A100 Null Modem Adapter connects and powers two Campbell Scientific peripherals via two CS I/O 9-pin connectors configured as a null modem. This is useful in linking different communications technologies, such as telephone to radio, at sites that do not have a data logger. The A105 adapter may be used to provide additional 12 V and ground terminals where the power supply is used to power several devices. If a CH150 or PS150 is hooked up to both solar and ac power supplies, which power supply does the device use? The CH150 or PS150 will pull power only from the source with the highest voltage at that moment. For example, the regulator will take the 20 W input from the 24 Vdc wall transformer rather than from the 18 V 50 W solar panel—even during the day. If the power goes out, the 50 W solar panel will charge during the day with no charging at night.